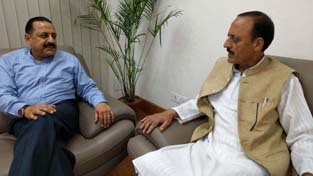 J&K Minister for Rural Development, Panchayati Raj and Law & Justice, Abdul Haq Khan calling on Union Minister Dr Jitendra Singh at New Delhi. 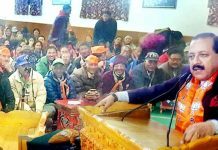 Union Minister Dr Jitendra Singh addressing a BJP election meeting at Leh . 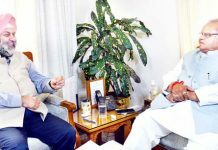 Governor Satya Pal Malik meeting with Manjeev Singh Puri, Indian Ambassador to Nepal on Tuesday. 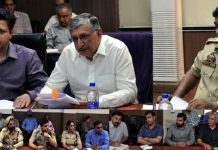 CEO SASB chairing a meeting on Tuesday. 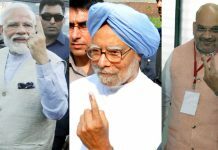 PM Narendra Modi, former PM Manmohan Singh and BJP chief Amit Shah showing signs of casting votes. 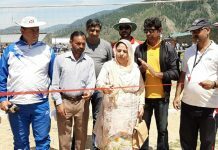 Dignitaries during launch of Red Chief showroom at Residency Road, Jammu. 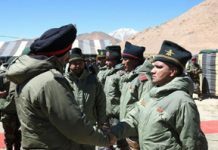 Lt Gen Ranbir Singh interacting with Soldiers in Eastern Ladakh on Tuesday. 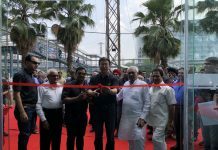 Minoru Kato and Yadvinder Singh Guleria inaugurating Honda BigWing. 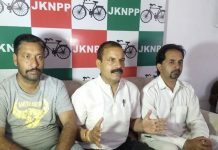 NPP president Balwant Singh Mankotia addressing a press conference at Udhampur on Tuesday. Doctor examining a patient at a medical camp in Katra on Tuesday. 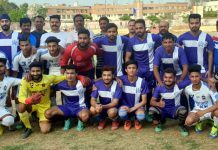 Teams posing with special guest and officials at Mini Football Stadium, Parade in Jammu on Tuesday. 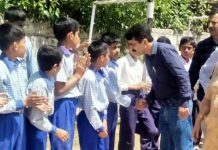 District Youth Services and Sports Officer Udhampur, Kharati Lal Sharma interacting with the students.